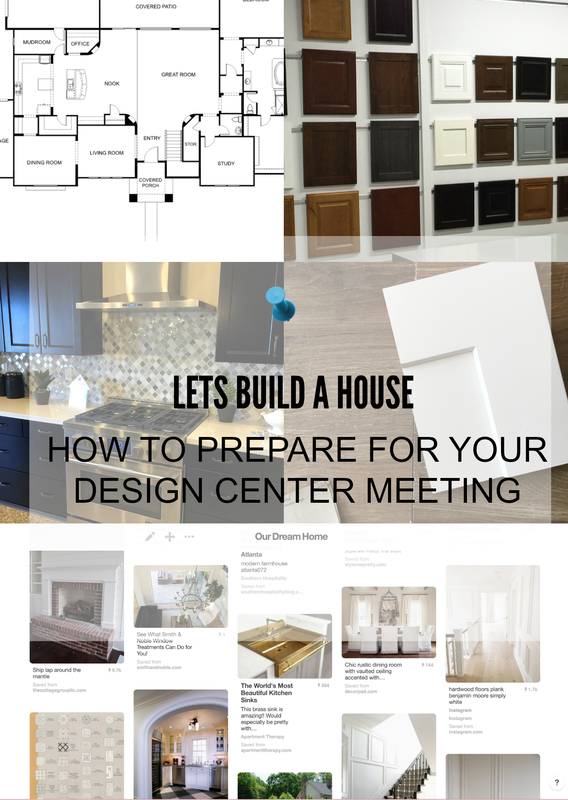 How to prepare for your design center meeting when you’re building a house is important! 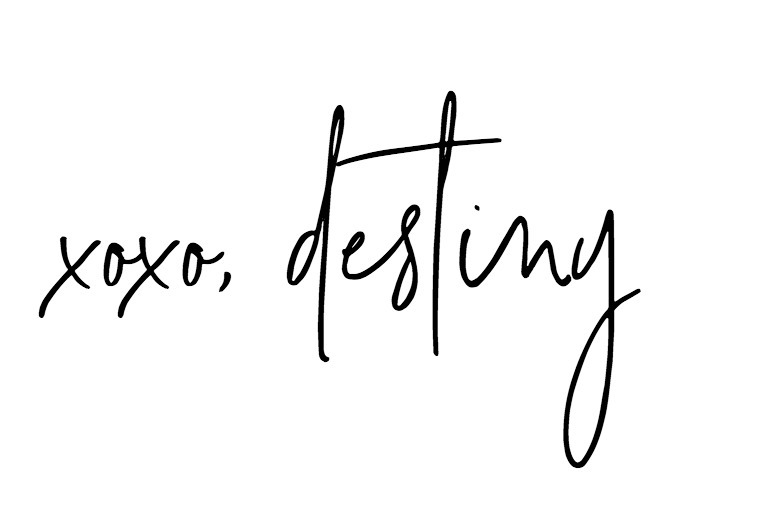 On Just Destiny Mag you will find some helpful tips as she walks through the process with you! I can’t believe we are in our new house!!!! We started this process in January, breaking ground in February and now here we are! Along the way I wanted to take you guys along on the journey but things got busy fast. I think I underestimated how much goes into building a house and still living life! Three weeks after we signed our contract, we were at the design center picking out our options for the kitchen, flooring, and all the other fun stuff. 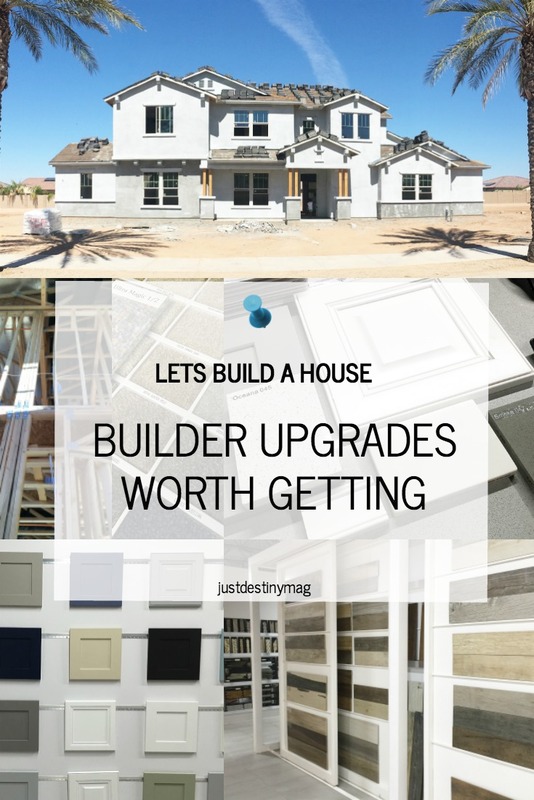 You can read about the builder upgrades we thought were worth getting here. 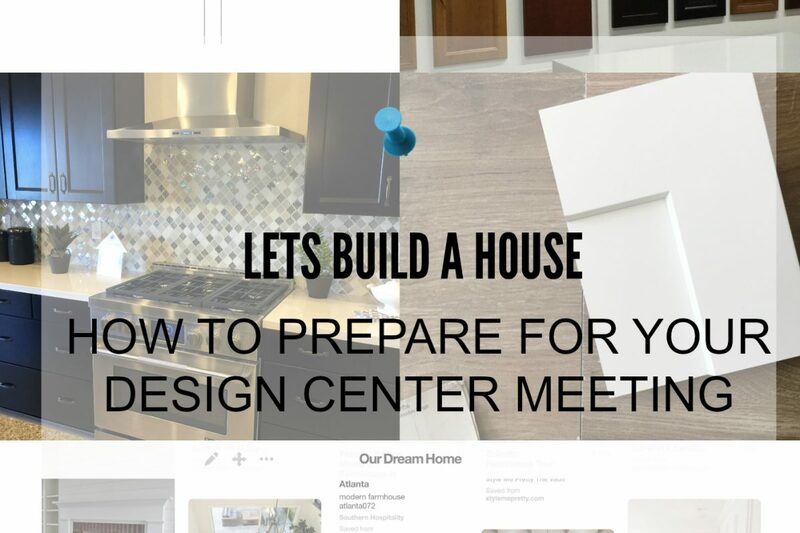 So today I’ve teamed up with our builder AV Homes again to bring you some tips on how to prepare for your design center meeting. Full Disclosure: After the experience we had with AV Homes I reached out to them about writing a few posts about our experience building a home. They happily agreed and gave us a small discount on our incentives! I know this may seem like a no brainer. But for your sanity, your spouse’s sanity and even the designer’s have a budget! The design center is a beautiful place and everything is like candy. You literally have thousands of choices when it comes to making your home just right. Reggie and I joked that it’s like having monopoly money in there! If you don’t come in with a budget and a plan, the experience can become a bit overwhelming. Reggie and I actually went over our budget BUT we still felt great about our choices. Our designer was so understanding about it even after we went back and forth, taking things off and adding things back. Ask to see all the standard options. They usually have some modeled at the design center or in the model homes. A lot of the times you will find the standard options work great. If they don’t then you know for sure what you want to upgrade! We ended up going with standard finishes in our master bathroom with thoughts of upgrading it later with a stand-alone tub. But we did upgrade the configuration of the bathroom because that would’ve been more expensive later. Oh yes. If you don’t have an account make one. Borrow one. Steal one. Ok maybe not that but please get one! This will help you get all of your ideas organized! Below you can see a snapshot of our dream home board. It gave me a great visual of how I wanted the entire house to feel and highlighted what elements were important to me. You can see below that I’m attracted to neutral colors, rustic elements with timeless finishes. I also have a kitchen board, trim board and even a landscape board to help me narrow down my style, needs and wants. I would also say, think about how you will use your home now and in the future! Before you start the process of purchasing your home I would ask for the design center’s number and get an estimate on how much the upgrades are on your wish list. That way you can decide what you need vs. what’s just a luxury. I’m very happy that AV understood this request. I’ve heard of other builders not giving you the same courtesy. 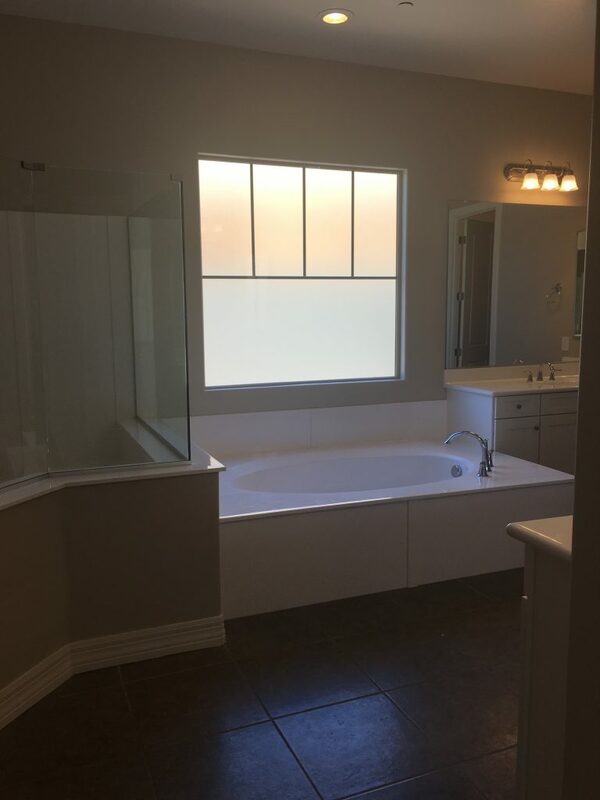 But AV Homes really wants this to be a great experience and allowing us to get a general idea of our upgrades was something that helped us move forward in the process of buying our home! I can’t imagine going into our design center appointment all excited about our new house, just to find out that I couldn’t upgrade kitchen cabinets or countertops because they were too expensive! AV Homes understands that most people have a budget and are happy to help! This way you can be prepared to add to your list if your budget allows or delete the items that are not as important! Here was my list…. 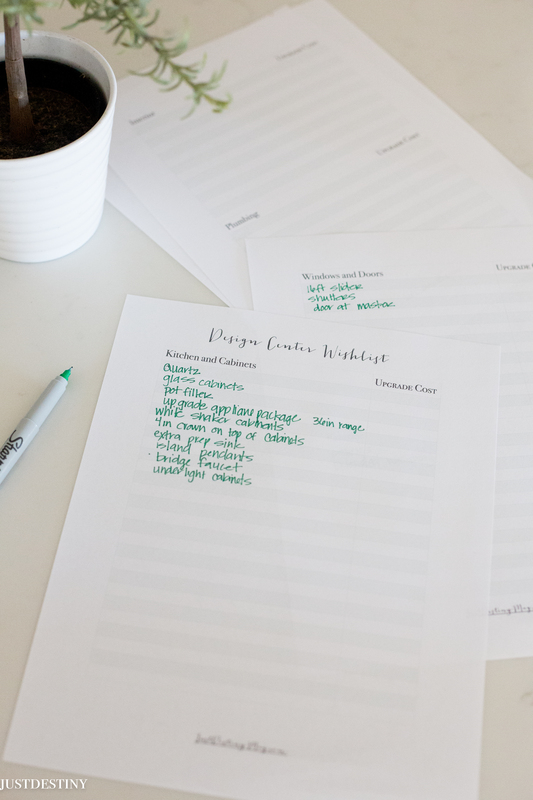 You can download the Design Center Wish List Worksheet to help you with your selection wish list. Here was what I had in mind before I emailed a design center designer. Print off pictures or have your laptop to show your designer your ideas. I liked having both. This is where your Pinterest board comes in handy. But you can also use magazines too! Anything that will help your designer get a feel for what you want, is helpful. For example, if they don’t have the option to install an ice maker, make sure you install an extra plug for it for when you do install it. That way you don’t need to worry about it any extra demos. Here is our floor plan. We used our builder’s interactive floorplan to plan extra outlets, layout furniture and other elements! We also pre-planned a laundry room downstairs. Why? Well our bedroom is downstairs and as we get older we don’t want to go upstairs to do laundry. But right now upstairs makes sense because that’s where most of the dirty clothes are! 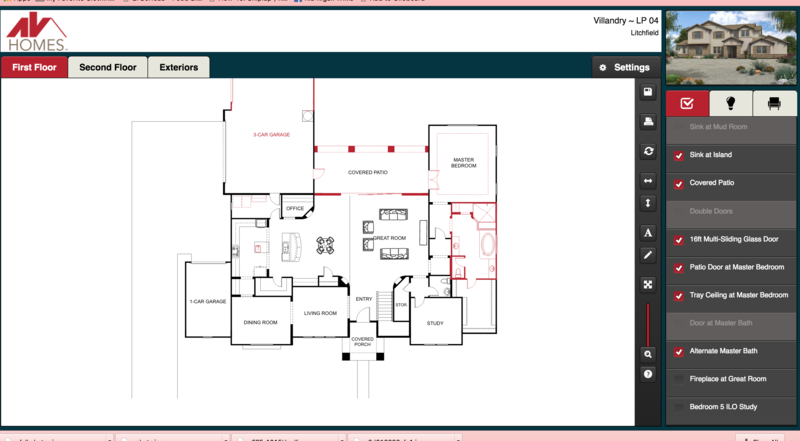 The floorplan helps you see how you are going to use the house so it was super helpful! Get a list of all your choices and take pictures of them BEFORE you leave. That way you can order samples for your home as you make decor choices and you will have a record of what you ordered just in case there is a mix up. I ordered a cabinet sample right away so I could coordinate other kitchen purchases with our white cabinets. This helped when we were picking floors and sofas! I also looked up all of our product numbers to see exactly what we were getting. For example, they didn’t have all of the appliances displayed so I looked them up online and downloaded the photos. Set up more time if you need it. Working through all the design choices in 4 hours may not be realistic for some people. Ask if you can make a stop by the design center before your actual appointment( a day or so ahead) . That way you can browse the selections and get a good feel for what you want. Don’t bring the kids, you will need to focus:0) Also, think about breaking up your time slot into two appointments. Maybe 2 hours one day and 2 hours another day. That way you have time to think about your choices and revise them as necessary. Do understand that because the builder wants to get your home done in a timely manner, you won’t be able to go back and forth day after day. But if you are PREPARED, you won’t feel rushed at all! Bring your own furniture samples! If you have furniture that you know will be going into the new house, make sure you bring those samples with you. Pillows, curtains, paint or anything that you think you might need for color matching purposes or that will influence the look of your new home. If you leave feeling sad, anxious or nervous about your choices CALL back right away or better yet, don’t leave until you feel good about what you have selected. Once construction has started it’s very hard to change any of your choices and if you do, it will slow down construction and possibly cost you more money. So take the time to do some of the things I talked about and be completely prepared for your design center meeting! Check out my other post about our building process…..
What color did you go for your ceiling? I just picked up your wall color and I’m excited to try it on my walls but I always get the ceiling color wrong. I’m heading to the design center in two weeks and want to be prepared. Your article is very helpful. Your new home is Gorgeous!!! Congrats. So happy you found it to be helpful! It’s a fun process. Praying that you have a great experience! Thank you for writing this post! We are about to start building a home and the design center has me the most anxious. This post helped ease my nerves. Congrats on your beautiful home! Hi Brickell ,I agree with you this was a excellent informative post you have shared on this page about the problem of construction during new custom homes with the estimation of cost buy using latest construction technology providing by a different private companies ,But if you have a plan to start a construction of a new building then you must discuss the cost of construction with a company and also check the quality of material given to you for your because some time the construction company delivered a low quality of material so in this case you may face some kind of financial problem due to the cost of material increase ,Transportation costs may be higher for the modules than for the materials from which they’re made, which can often be packed and shipped more efficiently to the building site with the cause of construction company . so you must be care full about this kind of issue . This blog was so perfect! Still relevant in 2019. I have an appointment with my builder’s design center next week. Reading through your blog validated that I’m not obsessing but PREPARING and most of your tips I’ve already completed and some tips I didn’t even think of. 🙂 Thank you for sharing!